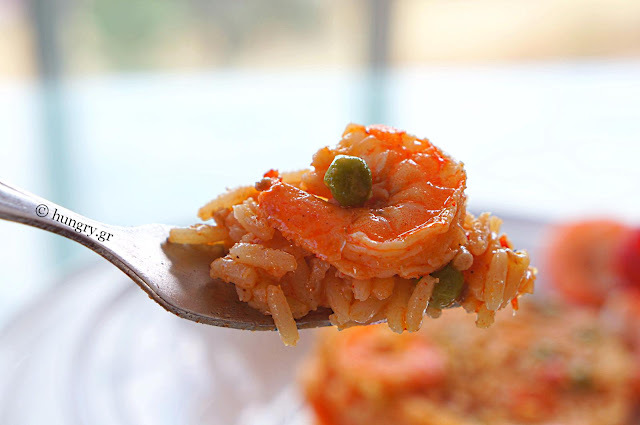 Shrimp pilaf with fresh bright red tomatoes, peas and carrot. 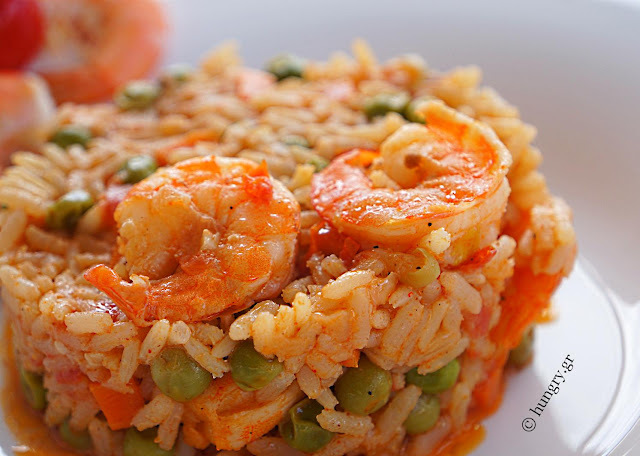 A very filling dish itself particularly tasty, with concentrated aromas of spices and ingredients. 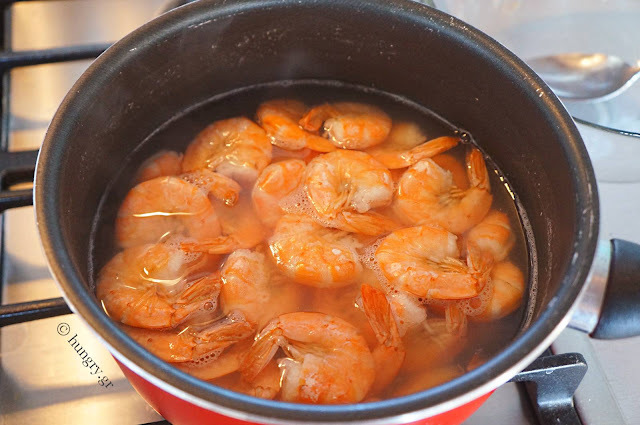 Begin by boiling the shrimp in 700 grams (1.5 lbs) of water with the bay leaf for 3 minutes from the moment he begins to boil. Drain the shrimp and keep aside until cool. We keep the water in which boiled. 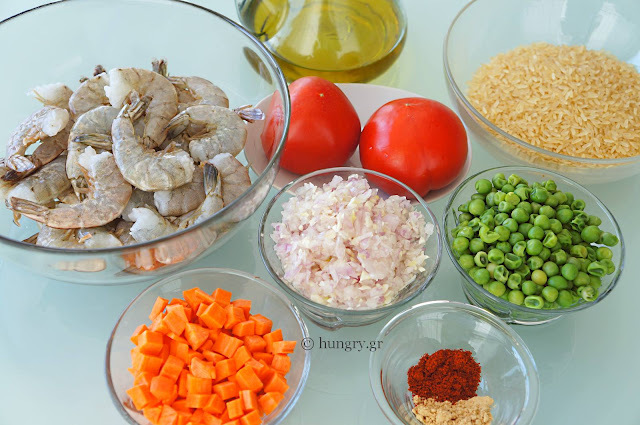 You will need it for the pilaf. When the shrimps are cool, clean them from their shells and set aside. In a small saucepan, boil in a little water the peas for 2-3 minutes. Drain them and pour cold water. Drain them again and set aside briefly. 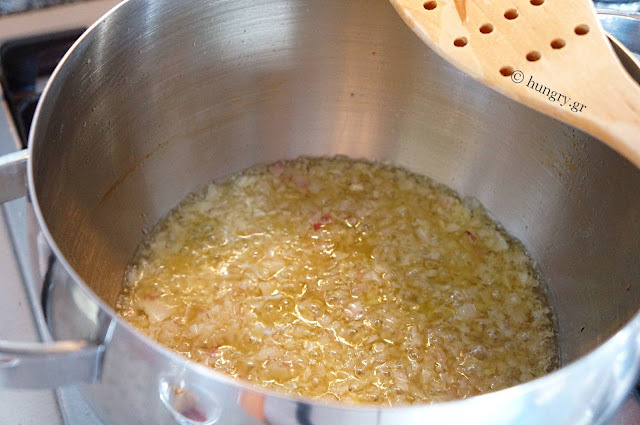 In a deep pot, add the olive oil to burn, add the pureed onion and garlic. 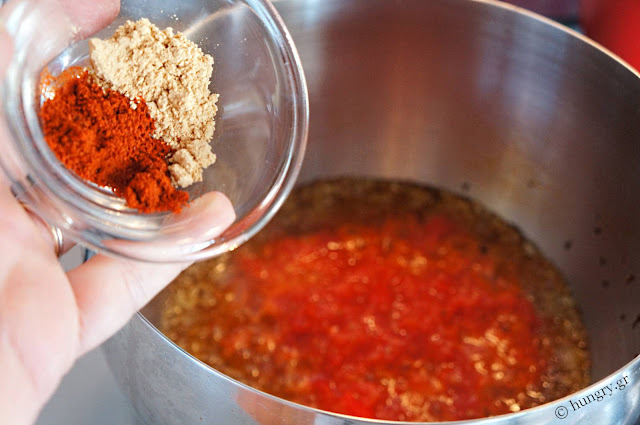 Sauté until they shine and begin to get light blonde color. Inside the pan add the crushed tomatoes and spices. 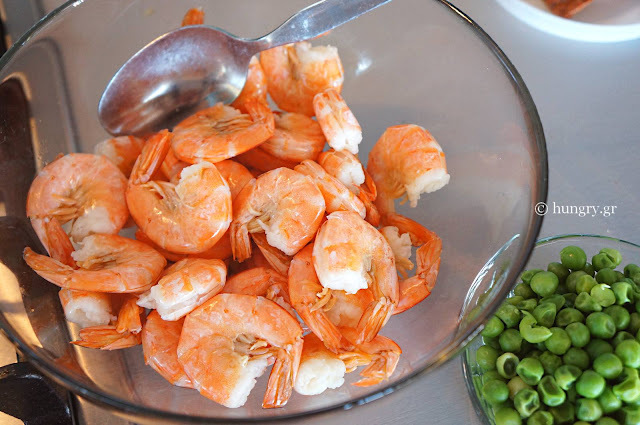 Stir and add half the water from the shrimp. 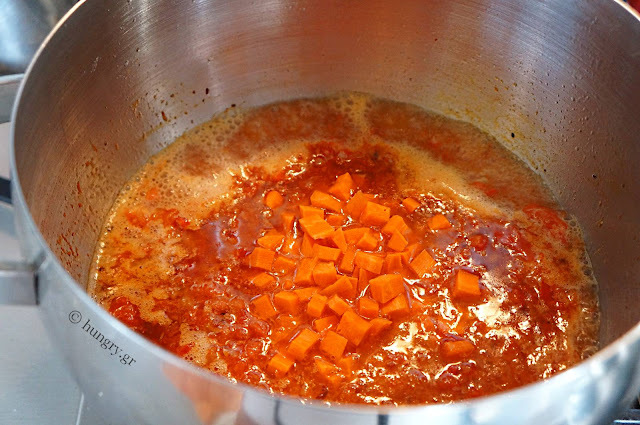 Once the sauce boils add the shredded carrot. Add salt and pepper. Allow to boil for 6'-7'. Add the rice, rinsed, and some of the water we kept aside. Allow the rice to cook. Stir occasionally, and when it is almost ready, control the amount of water, to be enough so as the rice does not dry. 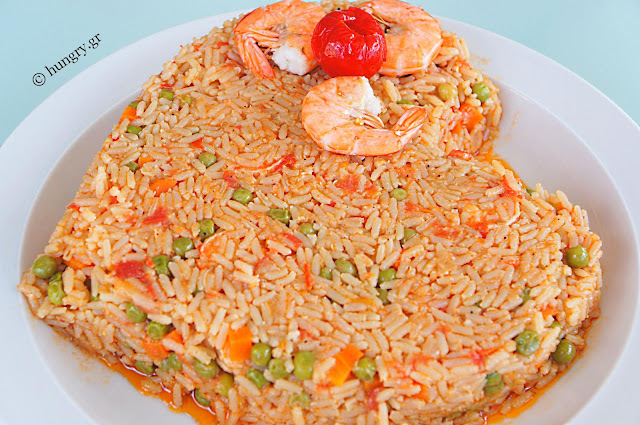 The rice should be able to absorb it. 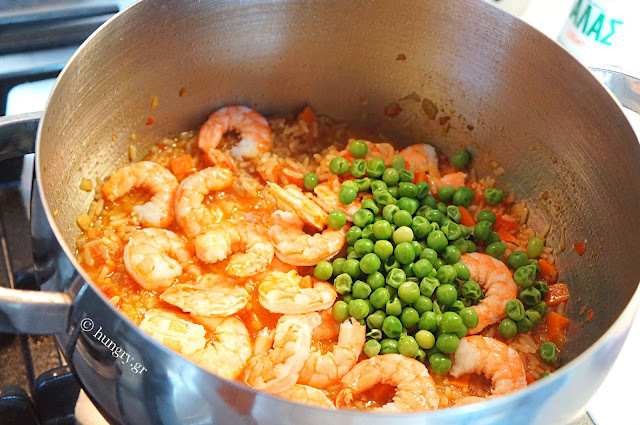 Finally add the cleaned shrimp and peas to boil together for 2 minutes. 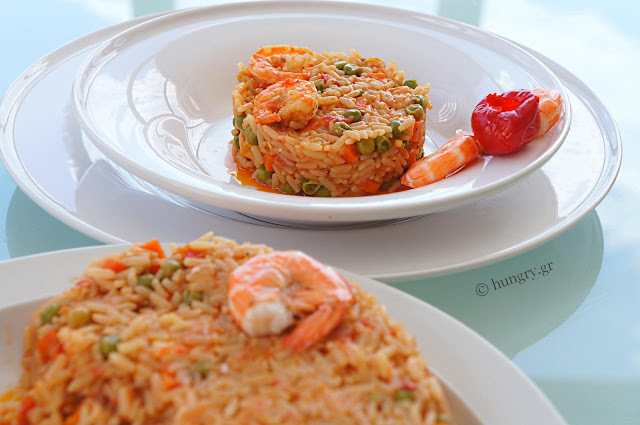 Mix well, try the rice if it is cooked and correct the taste with salt and pepper. Remove the pan from the heat, let the rice cool for very little and serve putting, if we so wish, in a platter for most beautiful effect. Tasty, aromatic, with a sweet aftertaste and oriental origins. Rice pilaf with liver, pine nuts, butter and fresh aromatic oriental spices. 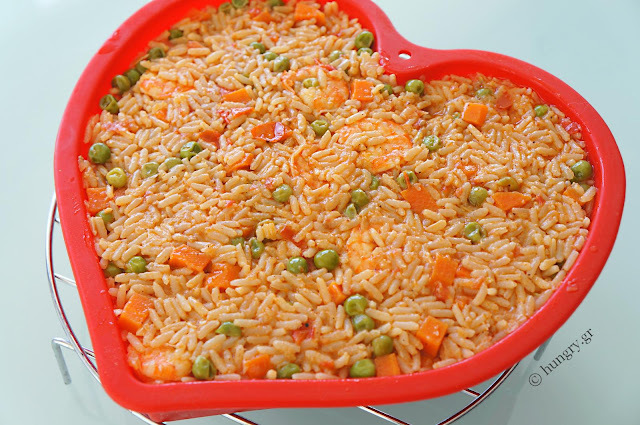 Very easy, hearty and tasty dish. 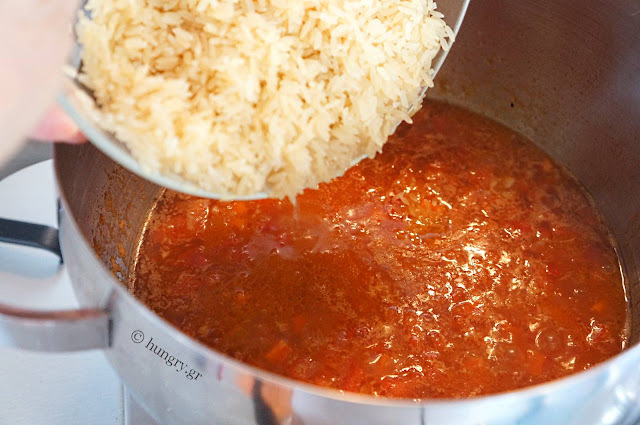 Rice flavored with Saffron and mushrooms. Served as side dish but can be enjoyed as main, along with a light salad. A classic Italian risotto with plump delicious shrimp, Italian carnaroli rice, with high starch and freshly grated parmesan make this dish. Cooked with one extra one touch of mine, which is wild asparagus of the mountain. 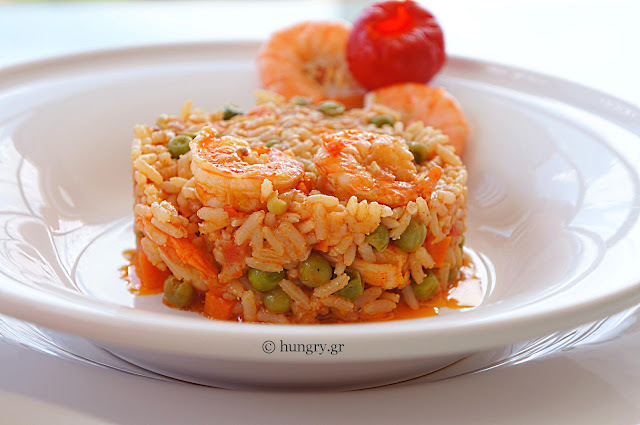 It is delicious and easy to prepare dish and only requires of us is care and "touch".